Young Isabella is barely a teenager when she and her brother are taken from their mother’s home to live under the watchful eye of their half-brother, King Enrique, and his sultry, conniving queen. There, Isabella is thrust into danger when she becomes an unwitting pawn in a plot to dethrone Enrique. Suspected of treason and held captive, she treads a perilous path, torn between loyalties, until at age seventeen she suddenly finds herself heiress of Castile, the largest kingdom in Spain. Plunged into a deadly conflict to secure her crown, she is determined to wed the one man she loves yet who is forbidden to her—Fernando, prince of Aragon. As they unite their two realms under “one crown, one country, one faith,” Isabella and Fernando face an impoverished Spain beset by enemies. With the future of her throne at stake, Isabella resists the zealous demands of the inquisitor Torquemada even as she is seduced by the dreams of an enigmatic navigator named Columbus. But when the Moors of the southern domain of Granada declare war, a violent, treacherous battle against an ancient adversary erupts, one that will test all of Isabella’s resolve, her courage, and her tenacious belief in her destiny. 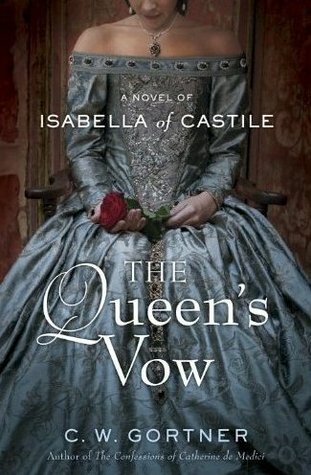 The Queen's Vow: A Novel of Isabella of Castile. WTF: Why did you choose to explore the life of Queen Isabella in lue of other, more popular queens? C.W. Gortner: I had explored Isabella’s later years in my first novel The Last Queen, about her daughter, Juana; in that book, we see Isabella through Juana’s eyes after the triumph of 1492 and her later struggle to secure Spain, after she suffered tragic loss. That somber, stalwart queen is very different from the younger Isabella, however. The story of how Isabella became queen, and the various challenges she faced on her way to the throne, as well as her passionate love for, and marriage to, Fernando of Aragon, is relatively unknown, which is why I decided to write THE QUEEN’S VOW. We tend to see Isabella in her later incarnation, the iron-willed Catholic monarch who sent Columbus to America and revived the Inquisition, but we forget that she was young once—a princess whom no one expected would ever rule. In a very crowded marketplace, where many of the more popular queens have been the subjects of multiple fictionalized interpretations, I believe the story of Isabella’s youth and how she ended up becoming Spain’s first great queen is both fresh and unique. WTF: The tone for this story is very intimate. What helped you find Isabella's voice? C.W. Gortner: It helped that I had written about her before, of course, albeit through another character’s eyes. I was also raised in southern Spain and Isabella has left an indelible mark on Spanish history; I’d visited her tomb in Granada, studied her reign in school. The challenge was to move past the hyperbole and distortions of the mythical Isabella I first learned about and discover the flesh and blood woman underneath her facade, whose desires, fears and hopes were obscured by her deeds. Though she lived in a time that was in many ways different from our own, she was still human. By learning about how she behaved in the circumstances she faced, how she acted, and just as importantly, how she didn’t act, I found valuable clues about the person she may have been. I found it fascinating that of the women I have thus far written about, she was without a doubt the most controversial; she was a very contained person, set on her path even from a young age. She had a strength of character that rarely wavered and uncommon determination that must have made her seem quite serene in public, yet she have struggled also with doubts, as we all do. I found official documents in which she revealed some of these doubts, so to recreate her it was really a matter of silencing my own preconceived notions of who she was, to not judge her for what she did or condemn who she ultimately became, in order to inhabit the young woman she was and reveal the transformation she underwent on her path to power. Her faith became her lodestone but it also hampered her ability to foresee the far-reaching consequences of her decisions. Isabella was both extraordinary for her era and a product of it. So, to find her voice, I had to understand what her era was like and how she saw the world around her. WTF: Do you have and writing rituals? C.W. Gortner: I tend not to be a ritualistic person, but I do try to write every day. I usually write in the early afternoon and set myself a word-count goal for each day. I can be superstitious in that I worry that if I don’t write, my instrument, as it were, will fail me. I feel that like musicians and other artists, writers must write regularly to keep their craft honed and sharp. Part of my “ritual” is also to read every day. Writers must read. I believe our craft benefits immeasurably by reading other writers. WTF: Who is your favorite royal? C.W. Gortner: At the moment, the one I’m writing about! WTF: If you could live under the rule of any monarch, which would choose? during the past. The 15th-16th centuries—eras in which all my books are set so far—were quixotic, brutal times, without a concept of civil or animal rights, or antibiotics or dry-cleaning for that matter. Monarchs could be, and often were, despotic and common people suffered greatly under the burden of their taxations and decisions. I guess if I had to choose, I’d live under the reign of Francois I of France simply because he had a more liberal view toward life. WTF: What occupation would you choose? C.W. Gortner: I’d be a painter at his court, under his patronage—versed in the styles of Florence. Francois I loved painters and often lavished money and protection on them. Leonardo da Vinci spent his final years at Francois’s court. I’d have loved to be apprenticed to Leonardo, whom I consider one of the geniuses of the Renaissance. Your Heart Will Hunger for "Eat Brains Love"
"White Trash Beautiful"... A Gorgeous Read! Adventure Shines Bright in "Midnight Frost"
Discover The Treasure of "Wasteland"